The 17-year-old came off the replacements' bench to make his first team debut on the wing and capped a fine cameo with the Aces' fourth try, sealing a 26-9 North Premier success. And that extra point could prove crucial as 'Gate now sit just one behind second-placed Blaydon, the team currently occupying the division's one play-off berth. 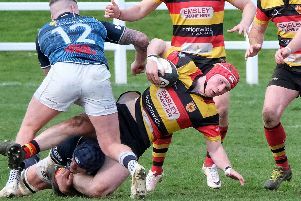 "Yatesy did really well, his try capped off a very good performance and it was important that we got that bonus point," said director of rugby Dave Doherty, the man who handed the Harrogate Colt his opportunity in the 1st XV. "He showed some lovely touches, his game-understanding was spot on and he took his try extremely well. "He's got a lot of talent and is going to be an excellent player in the future. We wanted to give him some first-team experience and I'm delighted with how it went." Yates is in his second year of colts rugby and had featured in almost every one of Harrogate's games over the past two seasons, growing in confidence and maturity along the way and developing into a stand-out performer. Overlooked by representative rugby coaches growing up, his consistent performances for Sam Fox's team led to a call up to Yorkshire's under-18s this season, for whom he featured in the number 10 shirt. A quiet and reserved character, Yates' rugby skills speak for themselves, with his game-management and positional awareness growing with every minute he plays. "Harry is a hard-working, reliable and well-liked member of the squad, and will only get better the more he plays," said Colts coach Fox. "I’m absolutely delighted he has been given an opportunity with the first team and I have no doubt there are many more caps coming his way." While Yates is looking at attending university next year, 'Gate will be keeping a close eye on his movements, hoping to utilise him in senior squad for the 2019/20 season. For now, the focus of both the Aces and Yates himself is very much on the final two league games of the campaign, beginning with Ilkley at Stratstone Stadium this Saturday.